Horses, mules, dogs, pigeons, even a baboon, all were a vital — and for decades overlooked — part of the Allied war machine. Researchers have been hard-pressed to find official accounts of the services rendered by animals. Today, they are emerging as unsung heroes of the Great War. France recently decided to recognize their role in war. And in 2004, Britain installed a huge memorial to the vital contributions of animals on the edge of London's Hyde Park. Here's a look at how four-legged and winged warriors contributed. This undated file photo shows machine gunners with mules crossing a trench in France during WWI. "They were quasi-combatants," said Serge Barcellini, comptroller general of the Armed Forces and head of Le Souvenir Français — The French Memory — in a recent speech devoted to the role played by beasts of war. Indeed, gas masks were fitted to the muzzles of four-legged warriors braving noxious battlefield fumes. In France, as in Britain and elsewhere, horses and mules were requisitioned. One typical sign posted in southern Paris ordered citizens to present their steeds and mules to the Requisition Committee by Nov. 14, 1914, or risk "prosecution by the military authority." It was becoming clear there would be no quick end to the war that ground on for four more years. In this March 7, 1918 file photo, men of U.S. Battery E, 5th Field Artillery Battalion, 1st Infantry Division, load horses onto freight cars in Toul, eastern France, en route to the French front. Cher Ami, or Dear Friend, the carrier pigeon who wouldn't quit, lived up to her name, saving the lives of 194 American troops of the "Lost Battalion" of the 77th Infantry Division, isolated behind enemy lines during the 1918 Meuse-Argonne offensive in eastern France. About 550 men had held their ground against a far larger German force for days before coming under fire from American troops unaware the trapped soldiers weren't the enemy. On Oct. 4, Maj. Charles Whittlesey sent Cher Ami into the skies with a final message giving the U.S. battalion's location, followed by a plea: "For heaven's sake stop it." Cher Ami lost an eye and a leg from German gunfire, but kept flying, around 25 miles (40 kilometers) in about a half-hour, according to the United States World War One Centennial Commission. Survivors of the "Lost Battalion" returned to American lines four days later. Another carrier pigeon named Vaillant, assigned to the French military, also performed extraordinary feats during the war. On June 4, 1916, he was released into the sky with the desperate message, "He's my last pigeon." French Commander Sylvain Eugene Raynal, encircled by Germans at the Fort de Vaux near Verdun, was counting on Vaillant to save his men. The feisty bird flew through toxic gas and smoke, reaching the Verdun pigeon loft choked by fumes. With no help arriving despite Vaillant's courageous effort, Raynal and his men surrendered three days later. Both Cher Ami and Vaillant were awarded France's Croix de Guerre, or War Cross. Lancers on horseback enter a Belgium village in the first days of the war on the Western Front in a 1914 photo. Among the more exotic animals called into service was a baboon named Jackie, who served with the 1st South African Infantry Brigade in then British-occupied Egypt and later in the trenches in France and Belgium. His acute hearing and keen eyesight helped warn soldiers of enemy movement or possible attacks when he would screech and tug on their clothing. Jackie was wounded in Flanders Fields when the South African brigade came under heavy shelling in April 1918 and his leg had to be amputated. Lt. Col. R.N. Woodsend, of Britain's Royal Medical Corps, described that procedure: "He lapped up the chloroform as if it had been whiskey, and was well under in a remarkably short time. It was a simple matter to amputate the leg with scissors." A Belgian machine gun detachment aims near Haelen, with a dog pulling a cart in August 1914. Man's best friend helped soldiers survive. Dogs served, firstly, as spotters of the wounded, learning to identify ally from enemy. They also served as sentinels, messengers, transporters and chasers of rats — the bane of the trenches along with lice and fleas. 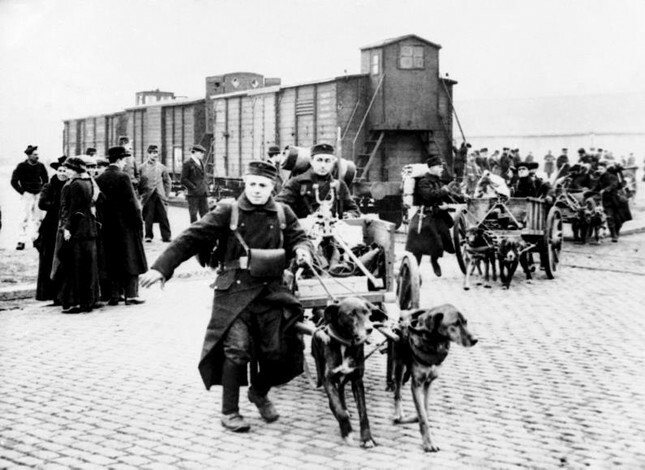 The French military created a service devoted to dogs of war in December 1915. Less official, but crucial to soldiers' morale, was the role of dogs and other creatures in the trenches, and as mascots. Stray dogs running from fighting were adopted as companions along with other animals, including a Royal Air Force fox mascot adopted by British pilots. These dogs and other mascots helped soldiers "think of life ... and the life they hoped to find again," said Baratay, the French historian, in a speech last month in Paris.